August 23rd, our little wedding filled with love, laughter & sunshine. We have been together for three years now, and we got married last month. It was such a lovely day. The sun was shining, and everyone was happy, relaxed and getting on with each other. We both felt blessed when we got back together, that we had been given another chance in love, in life, together again. I will not go on about the early years of us together, as that is in the past, all done and dusted. We have been together since 1998 though, except for 2007-2009 when i was by myself, with the four children. There were two main worries when we were planning the wedding what i had to get my head around. One was our darling son who is 22 years old. He has severe Autism, and how was he going to cope with the day. He doesn't like strange buildings, different sounds, and can get very upset. He has no speech, but makes noises. So you have to work out what is upsetting him, why, and how to change it. So once we knew where we were getting married, and where the reception venue was, we let the carer's know, and they took him to the places a couple of times so he could see and get the feel of the place. The register office, he was not keen on at all. He got a bit upset after about 15 minutes, so the carer's took him out. At the hotel after, he was absolutely brilliant. I was so proud of him, it made me shed a couple of tears. He had room to wander about, and there were chairs near the bar he could go and chill out in. He made my day, as well as making everyone else say how good he was. Everyone loves him. He could also go outside too, he didn't even bother with the chickens, as they are loose, i thought he might chase them. 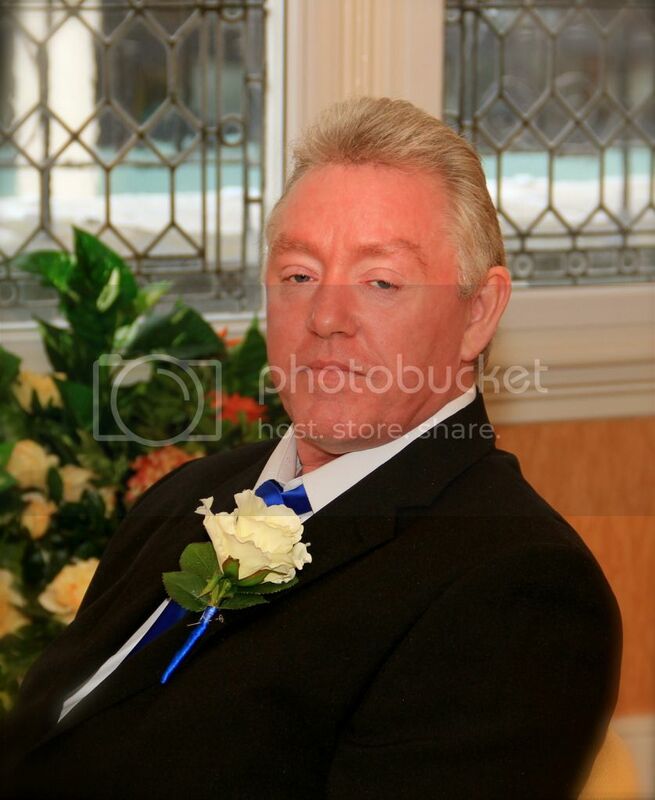 Second worry was as my darling dad passed away in 2007, how was i going to get married without him there. I am getting used to my darling dad not being here anymore, i can't say i have come to terms with him not being here, and not seeing him nearly everyday. At one point it was so bad, that after he passed away, all i wanted to do was be with him. With help from the doctors etc, and medication i don't think like that anymore. Who would give me away though. I wasn't too botherd about walking into the room myself, i only had tro walk about 18 feet to be with Tom. I asked my lovely mum, but she said she didnt feel right doing it, as it would of been my dads job to do. I can understand that, so mum was a witness. So i asked my eldest child. My darling daughter Rebecca, who is 29yrs old. She said she was only too willing to give me away. So that was sorted. Rebecca's two sons were going to hold the ring box's, and my two other darling daughters, Sophie who is 20, and Bethanie, the youngest at 19, were our bridesmaids. Bethanie's fiance', Andy was to be the other witness. 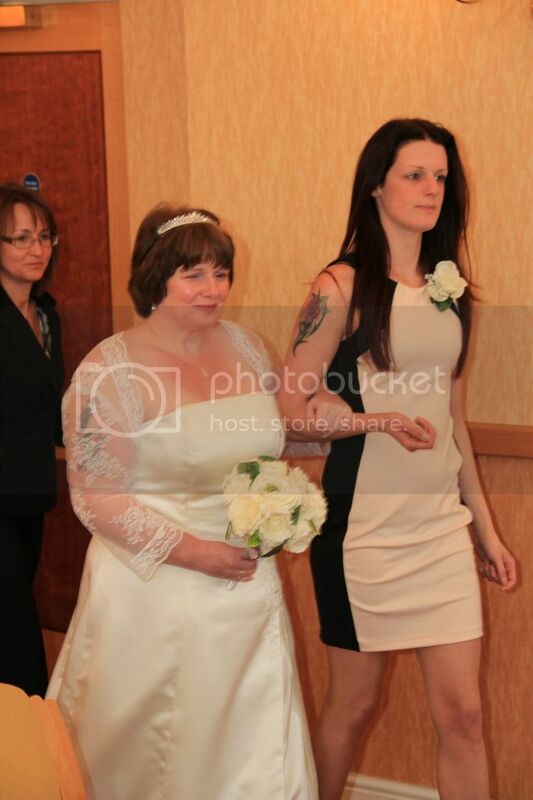 My mums partner was there on the day too. He has been so good for my mum, and they make a lovely couple. Mum was realy happy when we said he was welcome to come too. 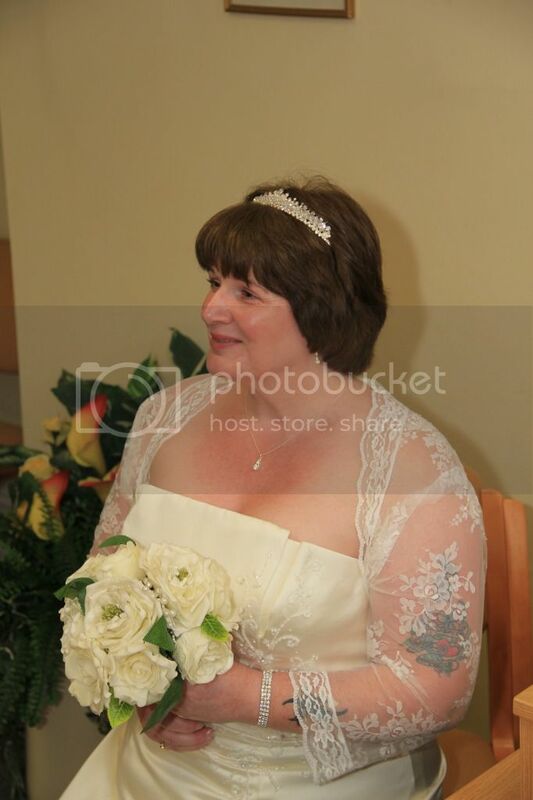 My mum wore some beautiful jewellery that my dear dad had brought her before he got so ill, so he was with my mum too on the day. 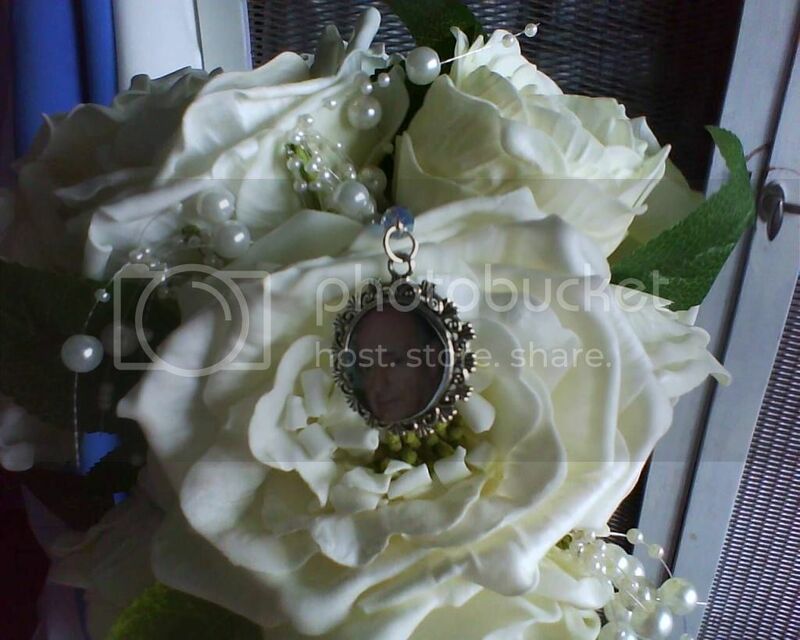 I had his photo in a bouquet brooch, so he was with me too. After thinking i wanted The Derby conference centre for ages, as their packages were very reasonable, there was alot of grassy areas for the children to play if they wanted. I went to a wedding fayre there. It felt cold, only about three pictures on the wall, and i just didn't like it. So it was back to the laptop to look for other venues. I can remember reading a thread about a bride who had her reception at The Melbourne view Hotel. We had been past it a few time's, as it's on the way to Donnington market, where the racing track is. So i looked it up, and it had everything we wanted. Small, and intimate, and family run. And it had the gardens for the children to play in if they wanted too. So we went to see it and booked it. So that was that done. We didn't have a Hen or Stag do. And we will have a Honeymoon next year. I turned 50 this July, so when i was looking for my dress, i knew i couldnt get away with certain styles. Also being only 5 foot 1ins and a size 16 in jeans, i knew i had to steer away from some styles too. Some of the dress's i saw were stunning. I didn't want a long train, if any, and i wanted something quite simple.But i still liked the thought of wearing Ivory. I tried about 12 on till i decided on mine, it's a Alexia design, and i loved it. I felt so comfy on the day i didnt want to take it off. 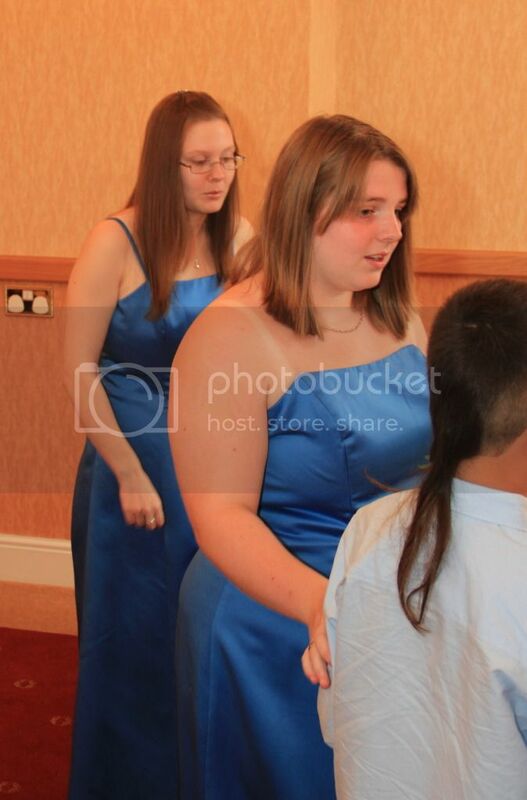 Sophie and Bethanie spent about an hour and half in the wedding shop deciding on a style that they both liked. I would of liked them to have a dress what went to their knees, but Bethanie doesn't like wearing dress's that much, so a floor length it was. The style they choose is Romantica of Devon. I like lots of colours, pink was out of the question, Sophie didnt want deep purple/Cadbury purple. I liked Aqua, they didnt. I have always loved blue, so after looking at different shades on the chart, we agreed on Royal blue. They could of had their dress's in one colour, but they liked the Ivory. So Royal blue and Ivory were the colours. Tom had always wanted to wear a black suit, even though he said he would wear Navy or Grey for me. In the end when it came to buying one, he got black,as that is what he feels comfy in. He did look handsome on the day. Yay!!! Congratulations!! Haven't been around much since getting married but glad I popped back to see the start of your report - sounds lovely so far and can't wait to hear more! When Tom proposed to me in October 2009, he had chosen the ring himself He knew i only wear yellow gold, and he also remembered my size. I had been having a off day, and was sat watching TV on the sofa. He came in to the living room, and said " Jayne", as i turned around, he had the ring box open, and asked me to marry him. Of course i said yes. The ring is a bezel cut diamond. And it fits beautifully. 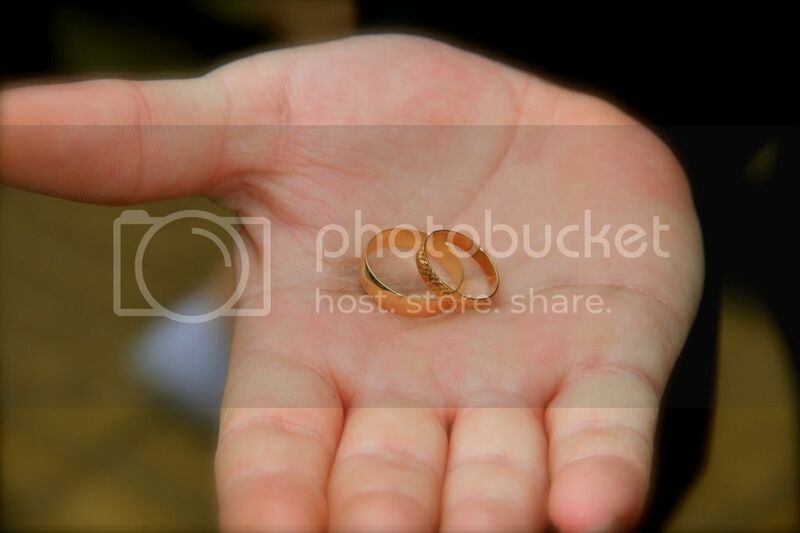 When it came to choose our wedding rings, we both wanted yellow gold. Tom just wanted a plain band. I didnt know if i wanted plain or one that had a pattern, so i tried a few on, and mine has a diamond cut pattern on it. It fits lovely with my engagement ring. Oh thanks lyndadavis3 And how are you finding married life. I have read your wedding report over and over again, it's just so lovely. It makes me want to go and visit London. These are some pictures of the hotel, it was so nice. Ah married life.... Much the same as non-married life!! Haha - but better of course! Still getting used to the new surname...! 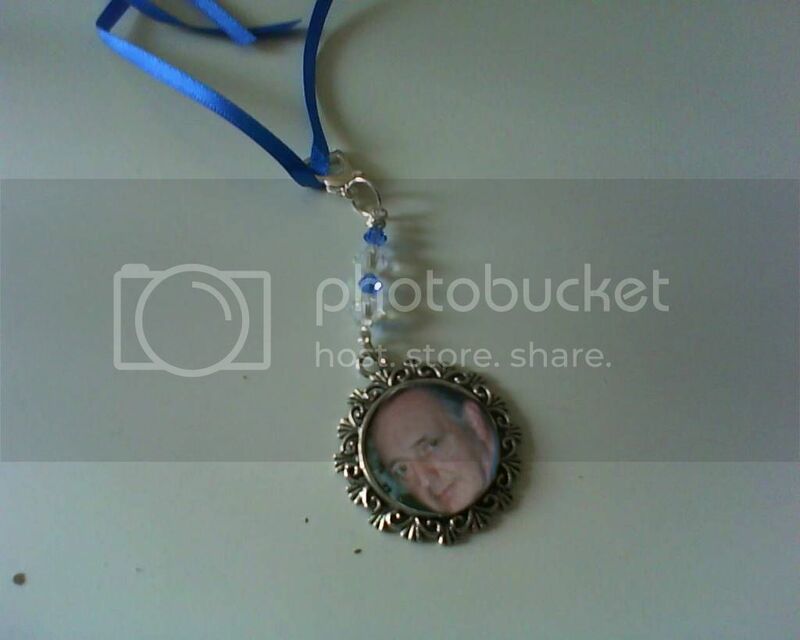 So lovely that you had your dad there in spirit in the brooch and that your daughter gave you away. Yay Bellington I've been looking forward to this report, cannot wait to read more. This report might not be in order of everything, but i will do my best. 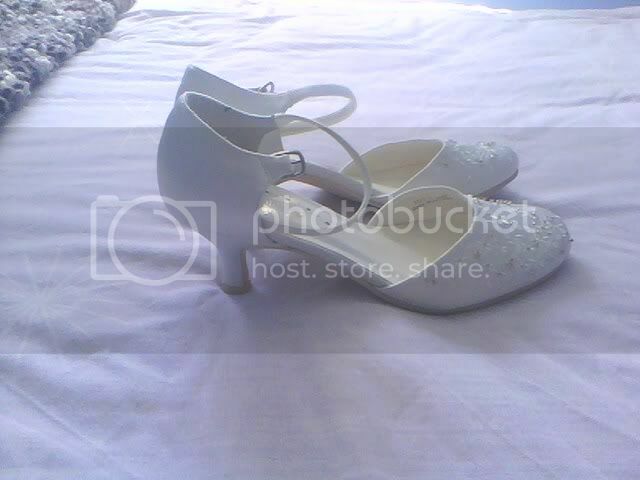 I have tiny feet, a size 2. so getting some nice shoes was going to be fun. 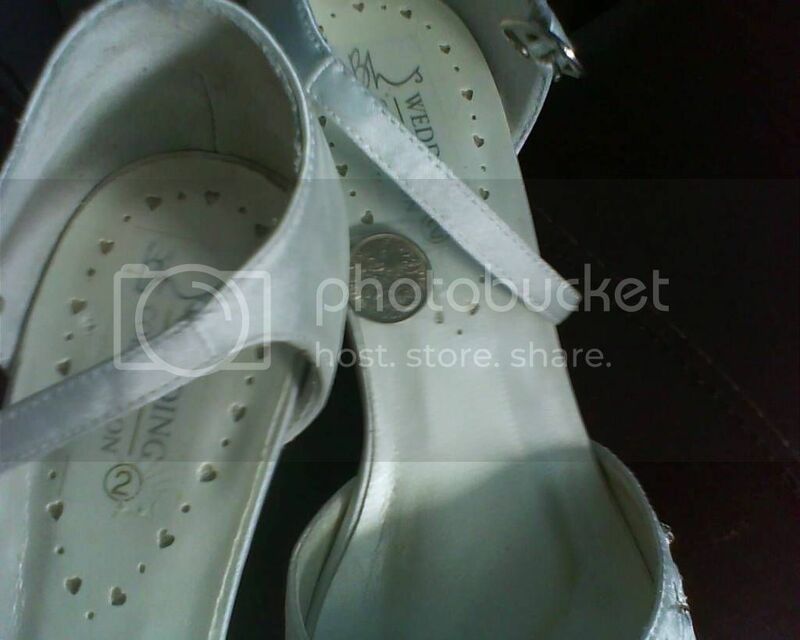 I love looking at all the other ladys pic's of shoes, i have seen some beautiful ones, but i can't wear high ones,as i have trouble with my ligaments/tendons, and every few years i have to have them snipped to release them. So they couldnt be more than 2inches high at the highest. After looking around town for ages, and trying lots of size 3's on, what were too big, i rememberd that good old BHS had a sale on. Its a good job i did go in there, as i got my shoes for half price, i think they are childrens, and a size 2. And here they are with the silver sixpence in. I didnt feel it at all. I had been wearing the shoes round the house to get used to them. 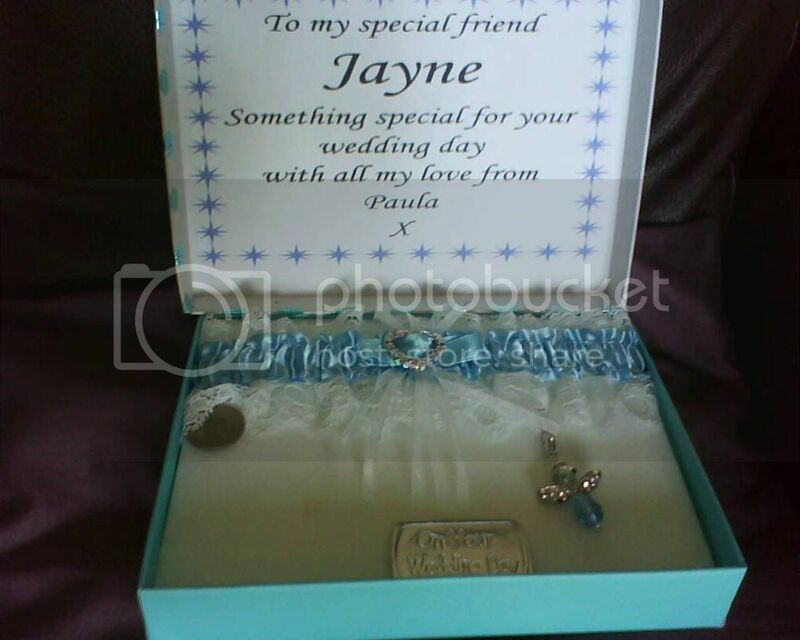 I had a beautiful gift come for me for the wedding, from my dear friend Paula. I wore the garter on the day, but have no pics of me wearing it. 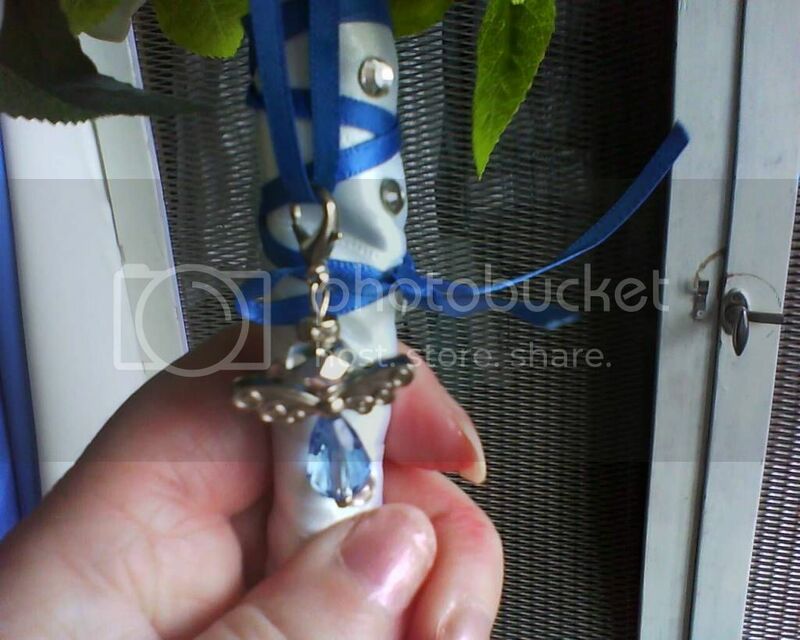 The sixpence went in my shoe, and the lovely little blue angel, went in my bouquet. They are back in the box now, and this gift i will treasure. 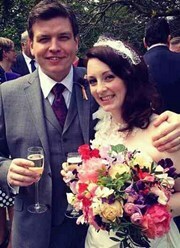 I became best friends with Ebay whilst planning the wedding, and i saved a fortune. 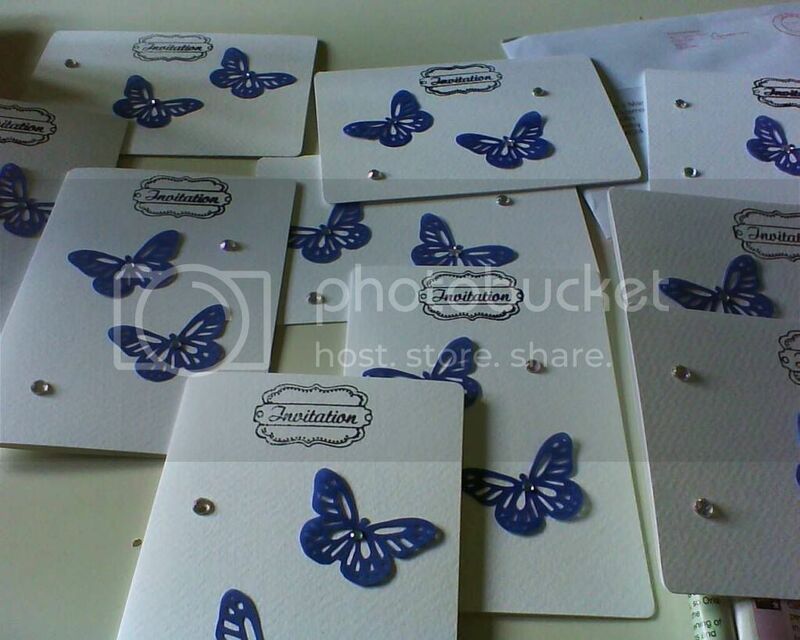 We didnt have a budget, but we knew it would be around the £ 5 or £6k at the most. To save £250, i decided not to have the chair covers, the round mirror, what went on the centre of the table, and the table number holders. The chairs were black and in good condition, so they were fine. It took me ages to decide what centre piece i wanted, i think i went through them all. Trust my luck for it to go wrong though. 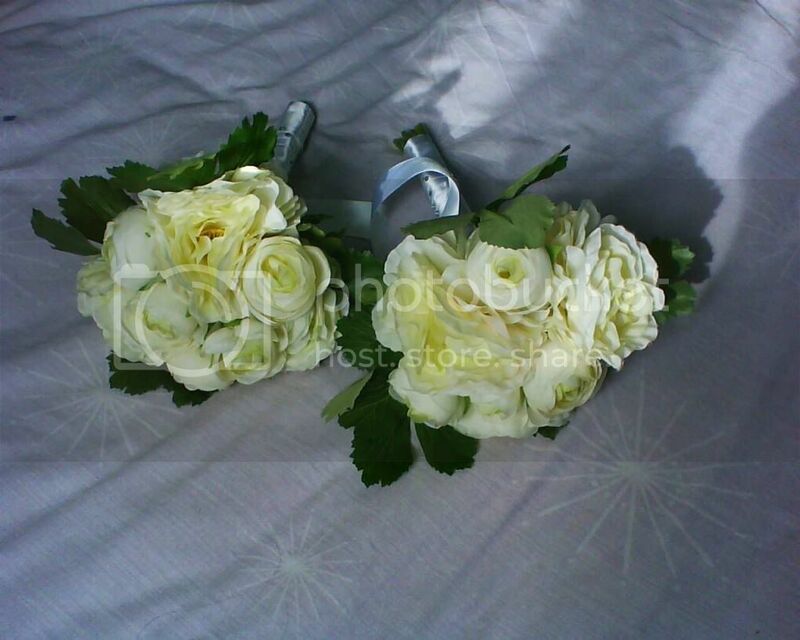 I had finaly decided to have a bud vase with 3 white/cream roses in, going down in size, simple & nice. Went over to Asda the day before the wedding, just before we were going up to take everything to the hotel, they had every colour but the one i wanted. So i had to decide what i was going to do, quickly. Luckily i had some off white roses in a vase with some purple ones, so i had to use those. But it was just one rose in a bud vase now. It looked fine, but trust me to leave it too late to get the others. I always knew i would have to have silk flowers for Bethanie, as she has such bad hay fever, so i got her and her sister Sophie the same as i didn't want them to look odd. After figgling about with them, as they looked scraggy, and putting ribbon with crystals around them, they looked quite nice. My bouquet was a buy from good old ebay. I love roses and peony's, and this reminded me of peony's. It has some beads in it, and it wasn't till a couple of days before the wedding i decided to keep them in, as i wasn't too sure about them. 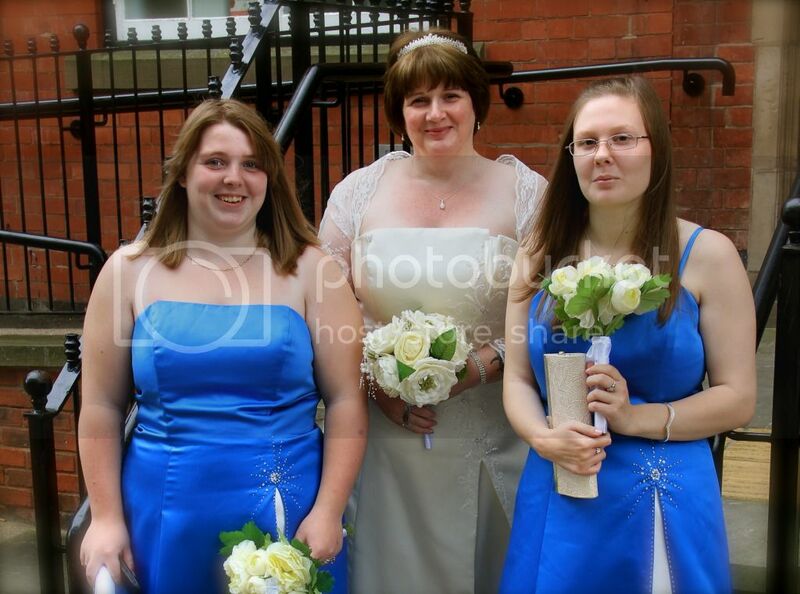 And this is me and my two daughters on the day. Bethanie on the left & Sophie on the right. Bethanie is mummy to my youngest grandson Joshua, who is 20 months old, If any one was going to be stealing the brides limelight it was him. Did i mind?? No way he is gorgeous, just like my older grandsons. 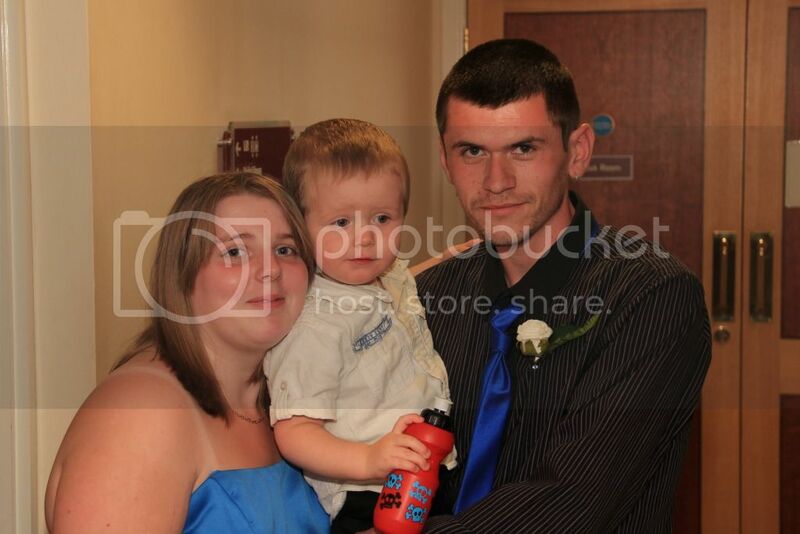 Bethanie with her fiance' Andy, and gorgeous little Joshua. When it camt for Tom to choose his suit, i asked him if he would wear Navy or grey, for a change. He said he would, even though i knew he prefferd black. So on the shopping trip to get his suit, guess what colour we got?? Yes, black. It's what he feels comfy in. 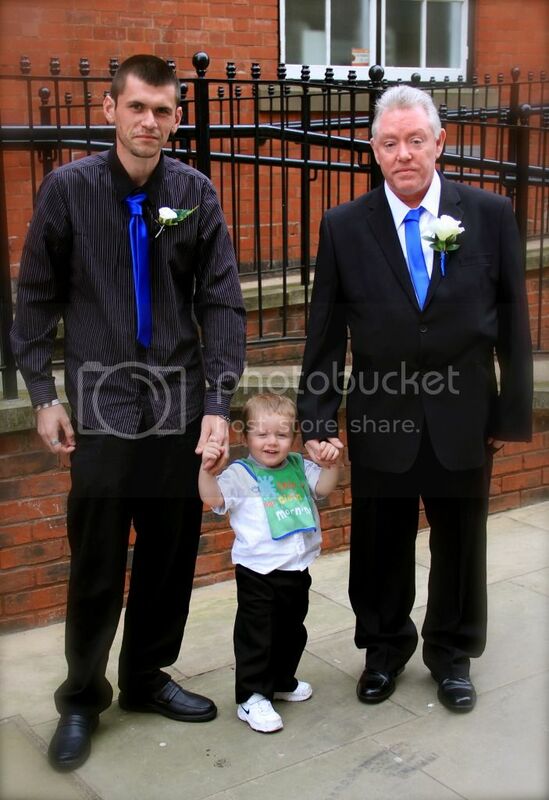 Andy was Toms witness, he never had a best man so to speak. I think he was going to ask my brother. But they couldnt make it. About 18 couldnt make it due to holidays, work etc. I tried my hand at three d.i.y projects i did. Never again as it's too stressful. 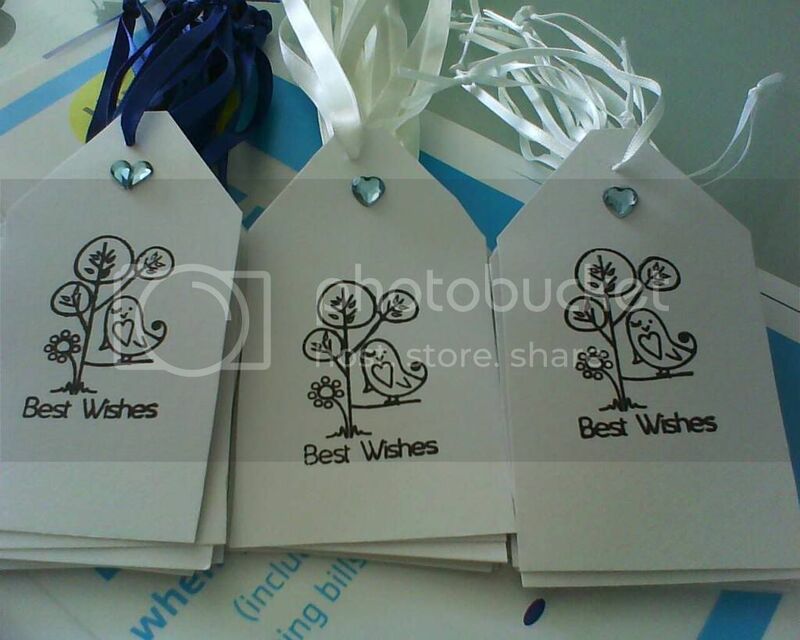 The invitations, tags for the wishing tree, and the wishing. 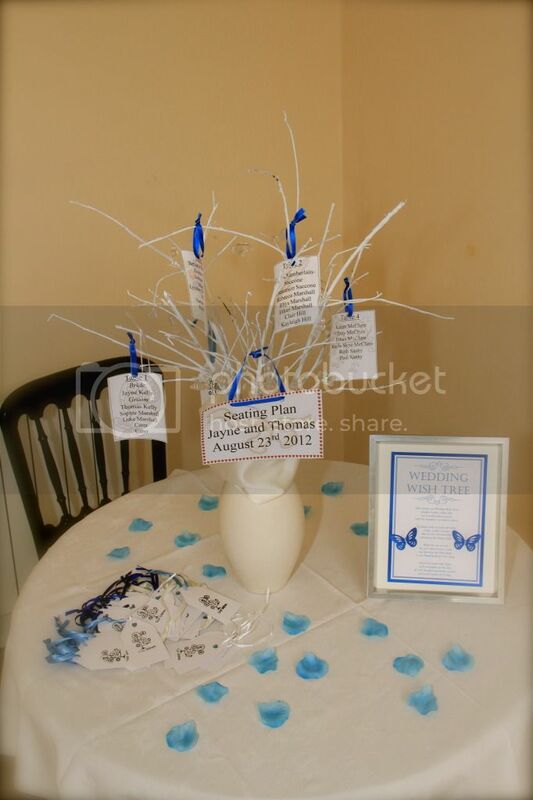 The wishing tree i used first as a seating plan, then took those tags off. You will see the tree later on with the seating tags on. The wishing tree at home. We decided that we weren't going to have a wedding car. It's not too far from our house into the city centre where the register office was. We get the local taxi's now and again, and i knew we could get a lift off one of the guests upto the hotel. Not very weddingy prehaps, but it was fine for us. On the day of the wedding, it was just like any other day. Except i kept thinking to my self, " Oh my goodness, it's finaly here, todays the day" Tom was glad the day was here too, as i had been getting very stressed with things. I got up at about 9am. Chilled out for a while and potted about. Me and Tom opend the cards that we had recieved from my brother, my niece and a friends who couldnt make it for the day. I had text's from people too, what was nice. Later on, i went to the bank, and to the shops. I saw one of my friends who works in the post office, who said " arent you getting married today" I said yes, but i had to do some shopping!! We both found it a giggle, as i was just chilled out by now. When i got home, and rang my darling sons flat. 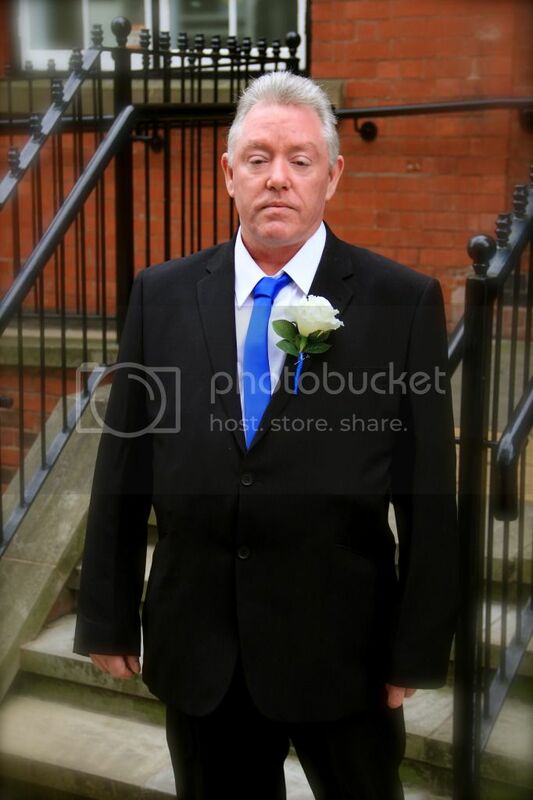 Just to see how he was, even though he wouldnt of known he was going to mum and dads wedding later, as he doesnt understand, it was just for me to know he was in a good mood i think. At noon, Bethanie, Andy and little Joshua came up to our house to get ready. Once all the showering and hair drying was out the way. Tom, Andy and Joshua left just after 1:30pm to go to the register office to meet the photographer. I got my makeup done, and was chatting with the girls. They kept on giggling as they got there dress's on. Once i had got mine on, i started to feel nervous. I didnt before. 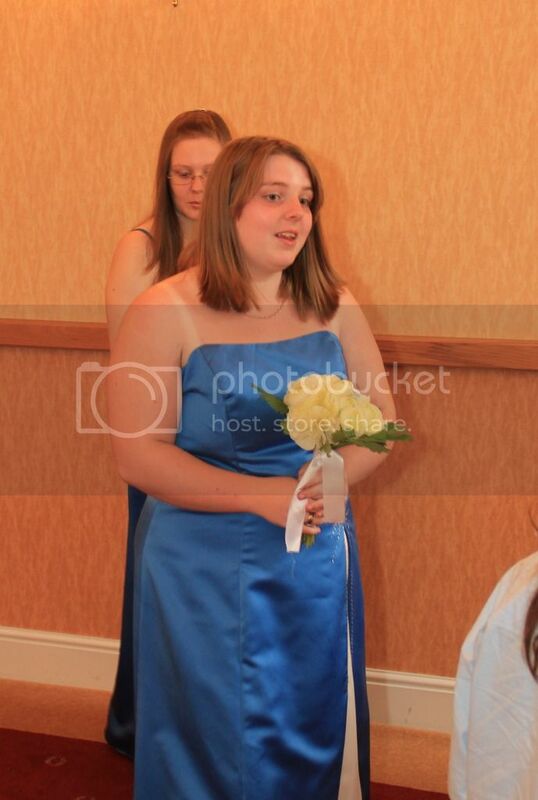 This was it, i was getting married we took our time,as our taxi wasn't picking us up till 2pm. Everything was going well, but the taxi was 10 minutes late I was not impressed, i had booked it a few days before, rang a day before the wedding to double check, and when the men left at 1:30pm, the driver double checked that ours would be here on time. When the taxi did arrive, and we were on our way, we must of hit every red traffic light from our house to the city centre. Me and the girls arrived just before 2:30pm. Our two elder grandsons Rhys and Ethan, were going to hold our rings for us. I decided to leave them in the box's, just in case they got dropped. 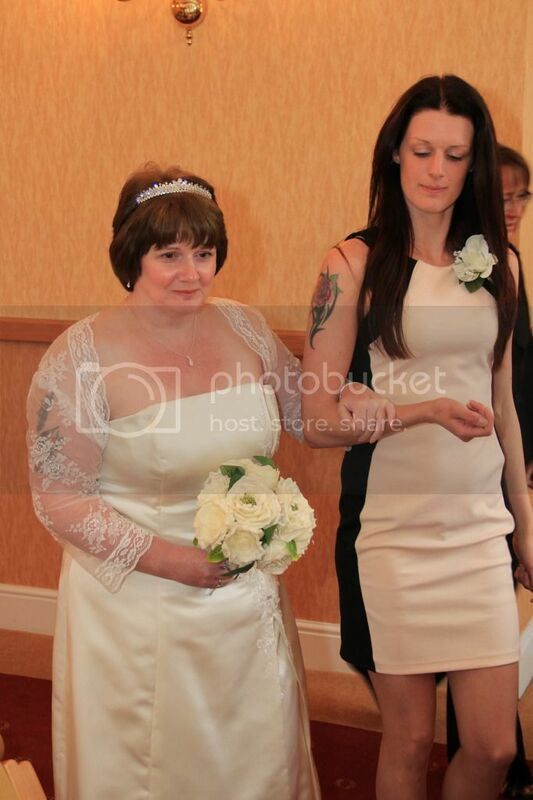 My eldest daughter, my eldest child, is Rhys and Ethans mum. 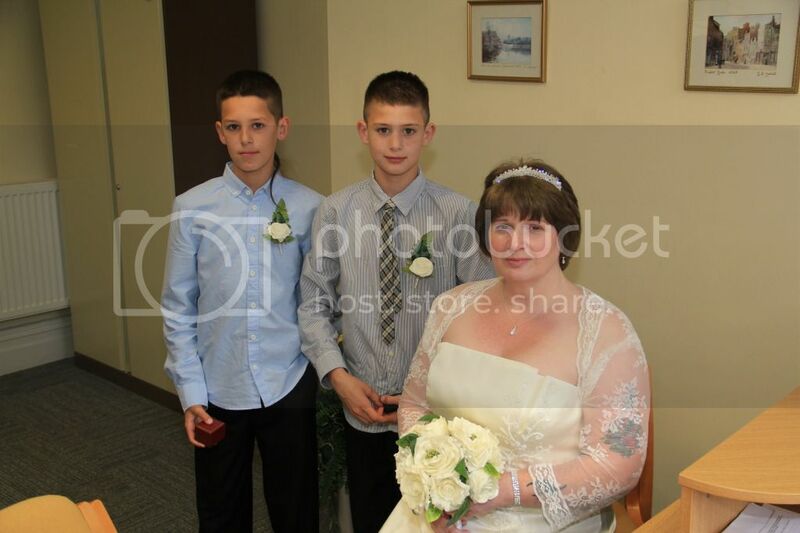 I didnt want Tom to see me before it was time for the service, so the boys were with me in the " brides room" whilst i went through things with the registra. This is me, Rhys and Ethan. And me just having a minute to myself. Hi Thirdthing2. I got the lace bloero/shrug from ebay £19.99p It was deliverd within three days too. Here is Tom waiting for me in the wedding room. I can't remember who went into the wedding room first. Grandsons or daughters. It was the grandsons, Rhys and Ethan. I think they were a little bit nervous. Next were Sophie and Bethanie. Then it was my turn. Rebecca wore high heels, like all the ladys do now days, so she towers above me. It wasn't far that i had to walk to get to Tom, all i wanted to do was walk slowly. So i could remember it. Once i got to him, i wasn't sure what side i had to stand, but i was on the right side. then i think for about a minute or so, my mind went blank. It was very strange. But i was OK after, it might of been abit of nerves or something. The registrar who performed the wedding was lovely, i think her name was Janet, i know it was Yvonne, who wrote everything out. It was just a Shame that Luke wasn't in the room, he had gone out,as he'd started to get abit upset.